About 30% of New Zealand homes are damp, and many houses have mould. Dehumidifiers and ventilation systems help fix the symptoms of the problem, but don’t always tackle the cause itself. In many cases, dampness is relatively cheap and easy to fix. Dollar for dollar, installing a ground moisture barrier is one of the best things you can do to improve the health and comfort of your home. By putting a cap on rising damp you can lower the moisture level in your home, which will reduce condensation and mould, as well as make the air feel more comfortable and the home easier to heat. If you do it yourself, the cost will come in just over one dollar per square metre. 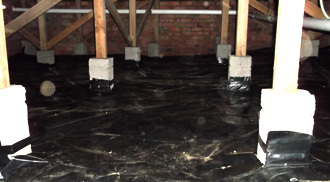 If you can get under your floor, check for signs of dampness like mould. Take some dirt and rub it firmly on your hand – if it stains like mud there is too much moisture present. • Check for water getting under the floor from drainage, guttering, downpipes or plumbing problems. • Install vents (if there aren’t any). • Uncover any vents blocked by plants, soil or pest barriers and clear the sub-floor area of any obstructions. • If you’re not sure about any of these actions, talk to a qualified builder.